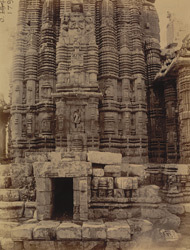 Photograph of the northern façade of the shrine of the Ananta Vasudeva Temple, Bhubaneshwar, from the Archaeological Survey of India Collections, taken by William Henry Cornish in c.1869. The Ananta Vasudeva Temple stands amongst the later temples of Bhubaneshwar. It was founded in 1278 and it is the only temple dedicated to Vishnu in a site predominantly Shaiva. The sanctum and the porch stand on an ornate platform. While the sanctum enshrines images of Krishna, Balarama and Subhadra, the sanctuary walls have sculptures of the Vishnu's incarnations. The porch is also elaborately ornate with carvings depicting Krishna, Balarama, Rama, Sita, Lakshmana and Hanuman and friezes depicting elephants and processions. The tower over the sanctuary is almost 19 metres high. This temple continues the plan and decorative scheme of the Lingaraja temple (later 11th century) but on a smaller scale.